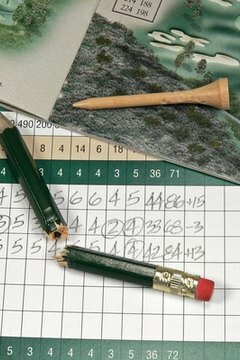 Handicap scoring isn't frustrating or confusing once you learn about its intricacies. The United States Golf Association (USGA) developed the handicap index system to allow golfers of all levels to compete with one another. Often referred to as a handicap, the USGA refers to its system as a "handicap index." The index is developed through a mathematical calculation that takes multiple rounds into account. Once an index is established, a player can subtract a certain number of strokes per round to determine his score relative to par. To get a USGA handicap index, a golfer must join a golf club, which it defines as a group of at least 10 "that operates under bylaws with committees (especially a handicap committee) to supervise golf activities, provide peer review and maintain the integrity of the USGA handicap system." Once you have joined a club, you must input at least five adjusted gross 18-hole scores into the handicap index system and your handicap index will be generated." The handicap index might be applied to any regulation golf course. Courses might have index charts posted. Players can then find their index on the chart that will determine what the course handicap is. On a more difficult course, a golfer might be entitled to more strokes, while on an easier course, a golfer might be entitled to fewer strokes. If for some reason you start a round but do not finish every hole, you can still input your score for handicap index calculation. For any hole you do not finish, you might record what the USGA defines as your "most likely score." For example, if you are playing in a match and your competitor holes out in 4 and you are laying 3 but are 30 feet from the hole, your "most likely score" would be a 5. You can record that score without holing out. The USGA's handicap system includes the "Equitable Stroke Control" procedure, which prevents abnormally high hole scores. The system sets a limit on the number of strokes a player can record based on his or her index. "Equitable Stroke Control" can be applied as follows: Course handicap of 9 or below: Double bogey. Course handicap of 10 to 19: 7. Course handicap of 20 to 29: 8. Course handicap of 30 to 39: 9. Course handicap of 40 and over: 10.